Have you ever had a friend who seemed to give you much more than you gave her or him? At times, we feel helpless ever to repay such friends for their many acts of love, and simply bask in the joy of their generosity. Sometimes we’re uncomfortable with this kind of gratitude, because we don’t like to feel as if we “owe” anyone anything. But in close friendship, such issues vanish into the steadfast understanding that keeps us connected no matter what. Our friends Janet and C.W. are the friends I am thinking of as I write this. 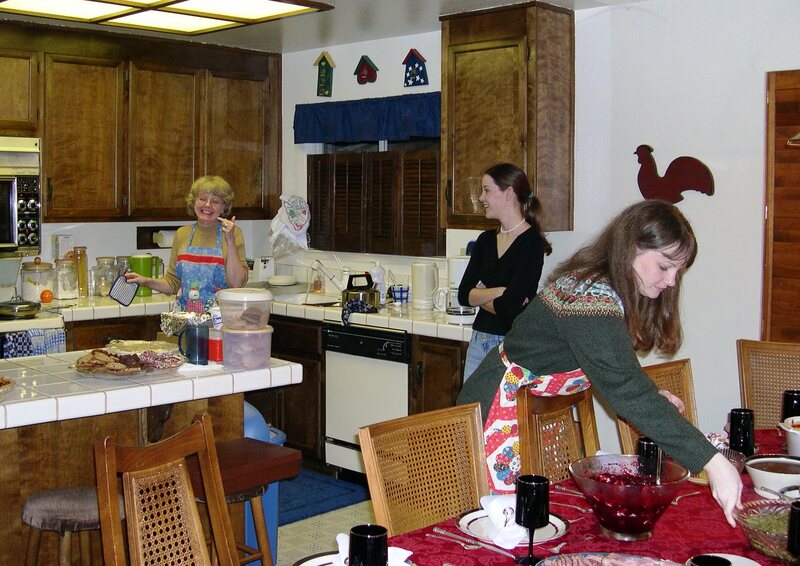 While we lived in northern California, we spent every single Christmas Eve with them and their family, and many New Years Eves and other holidays as well. But we never needed an occasion to be invited to their home for Janet’s amazing cooking, which is right up there with my mother’s and grandmother’s in terms of how delicious and well-prepared everything always was. I often say that the nicest thing anyone can do for me is to cook for me. Boy, has Janet done that more times than I could count! And C. W. is no slouch in the kitchen himself! I would guess that Janet had us over at least ten times as often as we had her over, but she never seemed to be counting, so I didn’t. We liked many of the same places, knew many of the same people, shared lots of joys and sorrows and never kept track of things that didn’t matter. For that, I’m so grateful, and as Bonhoeffer says, very rich. Who came to your mind as you read this post? Some of us who are perpetual caregivers rely on people who give us more than we are able to give back to them, and they continue to give with enthusiastic, contagious joy. I hope you have many such people in your life, filling your days with riches that have nothing to do with money. Update: Prizes and party favors are in the mail! For details, click on “Thank you!” above. Definitely cue up “the Waltons” theme or if you are old enough to remember it, “Over the river and through the woods.” One of the best commercials ever made, IMO, was an Alka Seltzer commercial many years ago that had that song playing in the background as the grandmother brought dish after dish from the kitchen for Thanksgiving dinner. “Here are the mashed potatoes…and here are the scalloped potatoes…” The husband says sarcastically to the wife, “What, no baked potatoes?” and you hear the grandmother’s voice singing out from the kitchen, “Don’t forget the baked potatoes!” Thanks for being here and I hope you and your family have a great holiday visit! Julia, You come to mind when I read this post. What lovely friends. I wish you joy my friend in every way. Love ya. Thanks Amy, I somehow missed your email from Saturday morning – will get to it soon! Hope you have a good week. I am back. Hope you and your dear ones are fine. For the time being I have missed all those anniversary special posts. Reading this I was thinking of my aunt (maternal uncle’s wife) who is fond of inviting people to her home and never gets tired of cooking and doing all sort of help for her friends and relatives. She has some special sense to understand the requirements of others. She is sixty-plus but such a busy bee, so practical-minded and energetic. Though at times she may sound bit imposing we know she is so sweet and kind at heart. Enjoyed this post a lot, Julia! Bindu, I’m so glad you enjoyed the post. People such as Janet and the aunt you describe amaze me how they can produce such wonderful meals without getting stressed out about it. Cooking is not my strong point, although I like to do it when there is no pressure. I think we often feel intimidated by those who are good at so many things, but as you say, their kindness is reassuring. BTW Janet is a recently-retired teacher; she taught high school math for many years, and I suspect that I probably could not have passed some of the tests she gave her students! I, too, have enjoyed Janet’s wonderful hospitality and cooking. She is a kick and a love and one of my favorite people on this earth. C.W. is a doll!! 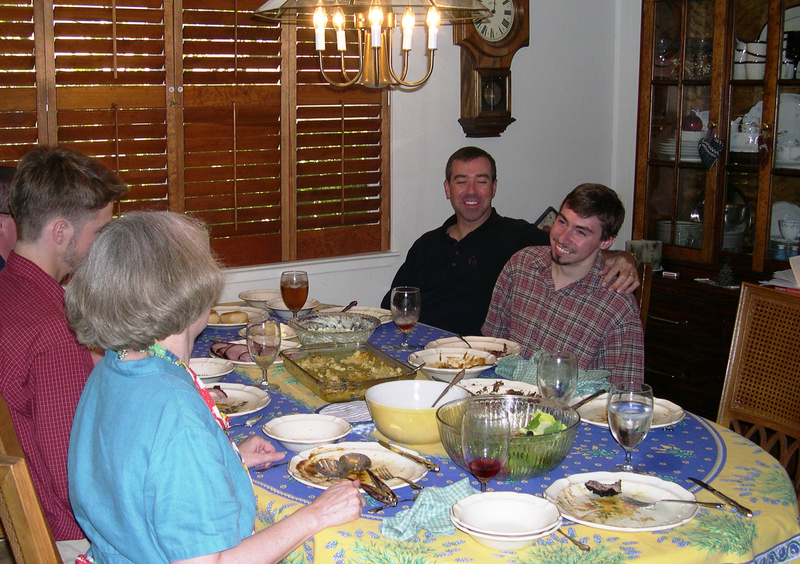 So happy to hear of your wonderful memories of times and dinners shared with this great family. I tell Janet she is “the real deal” because she knows just what to do and just what to say, at just the right time. One of my best memories is of a delicious lunch of stew, in the quiet of her home, to soothe me after my sister passed away. It was an offering of love, pure and simple. Thanks Terri, isn’t it wonderful to have people such as Janet and C.W. in our “faith family?” They are true givers who live out the meaning of “more blessed to give than receive.” Thanks for sharing your thoughts of them with us! I am so happy to have you visit us here at the blog. Hi Sheila, today was hard, but there were also lovely moments. I’m about to write a post for Wednesday about my walk today (not two weeks ahead anymore! :-() It was a perfect day today, weather-wise. 70 degrees and sunny. I am ready for the holiday season now! I live in northern CA….hmmm, I wonder if Janet would mind a visitor? 😉 She and C.W. sound incredible. They are the best. Janet would probably love a visitor (Janet, are you reading this?) but I must warn you, she stays very booked up. She travels all over the place and stays busy when she’s home, too. But she’s worth waiting for! Praise God for wonderful hosts. 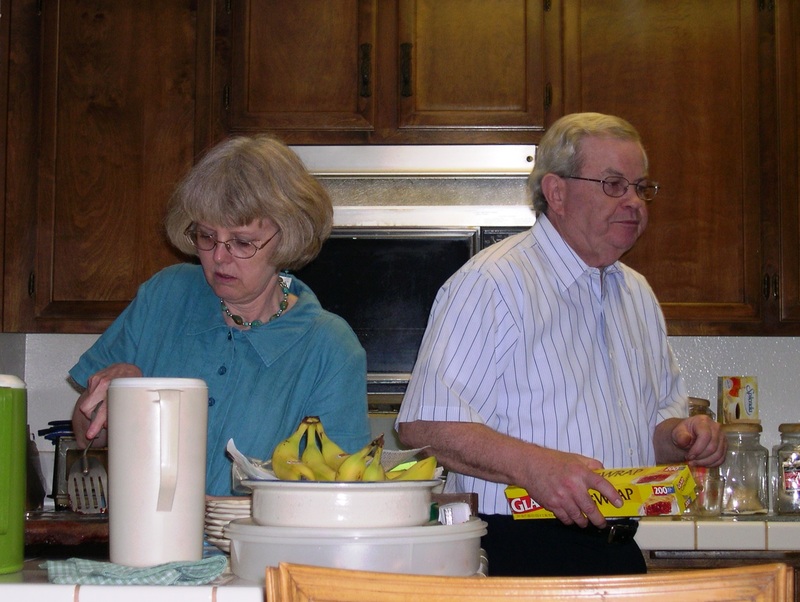 I was just thinking today of a couple – Ivan and Janet – who have such a gift of hospitality. God bless them. Hospitality is so important, and sometimes I fear it’s becoming a lost art. There is nothing like spending time in peoples’ homes (or they in ours) to help us feel connected to them in a way that goes beyond most other settings and relationships. Hope things are going well with your book! Keep us posted. Thank you – that’s very good advice. It is all to easy to let friendships become distant when we are separated by geography or even just by busyness when we live near each other. I appreciate your visits here! This is like a homecoming party of our friends: the post about Janet & C.W. & the comment by Terri makes it joy-filled for me! Love & prayers to my Dentons! The photo shows lots of smiles for me to treasure! Thank you, Mary Ann! I know you will be showing up here on this blog sooner or later :-). I didn’t warn Janet so I don’t even think she knows (yet) that they are on here! I bet you missed them like crazy! Some people are just born hostesses and make the art of putting together a meal seem so easy. We have friends like this, they’ve always included us in their Holiday gatherings like Thanksgiving and Christmas and other friends that we enjoyed a lot of their children’s birthday celebrations. I guess it was easier for us to go there since they had kids and we didn’t, we sure appreciated being including. Now that their own kids are grown, we’ve been invited to their homes too, which is so very nice. Even when you haven’t seen a good friends in a long time, it’s always easy breezy to pick up exactly where you left off. Yes, we still keep in touch with people from every single place where we have lived. It’s just as you say, when we get together it’s as if we have never been apart. This was a summer of many reunions for me, all of them unrelated to Jeff’s illness, but a blessing during a difficult time. My dear friend Ellis and I were able to spend a day and night together after having gone 35 years without seeing each other, just keeping in touch by letters and then computers! She played her guitar and sang for me as she used to do in those long-ago days in the dorm at college. Then Jeff and I were able to visit with another college friend, Maggie, whom I had not seen for several years. And of course, the reunion I wrote about here, with my fourth grade teacher I had not seen for almost FIFTY years! I am so thankful for each and every friend I have. It amazes me how unique each person is, and what wonderful intangible gifts they give us that can come only from them as individuals. Thank you so much :-). I appreciate your being with us on this journey!